With house sales grinding to a halt, why not spruce up your current property instead? But if you don't fancy wielding a paintbrush for hours, help is at hand from Bosch power tools with the latest additions to its Fine Spray Gun range. The new Bosch PFS guns create brilliant coats of paint on smooth or heavily textured surfaces alike - three times faster than a paintbrush! They work with a low-pressure "SprayControl Technology" where an air jacket accurately focuses the paint mist when spraying so that you use up to 15 per cent less paint. Plus, the air jet speeds up the drying process and a second coat can be instantly applied. 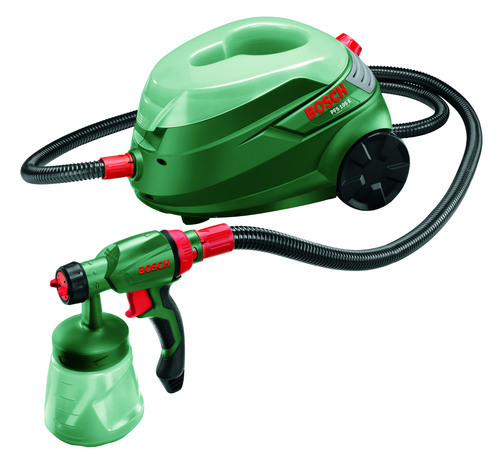 The new Bosch PFS 105E is ideal for spraying internal rooms as well as large outdoor surfaces. It's a flexible, mobile system with electronic airflow - allowing you to control the paint mist to suit the type of material being used. The lightweight spray gun and 3.4 meter air hose allow work from different angles, and the base unit with wheels has a sophisticated storage system for the air hose. The new Bosch PFS 55 is a hand-held system for small to medium spraying tasks, such as furniture or even wooden toys. The integrated paint flow control can be set using the infinitely variable wheel in the switch. It is also perfectly suited for spraying pesticides on plants. Completing the spray gun range is the PFS 65, which became available for the first time this Summer. This is a compact, portable system perfect for medium sized projects such as larger pieces of furniture, garden fences or sheds. The low weight of its spray gun and the flexible air hose allow for easy working, even in awkward positions or overhead. When the work is done, the hose is conveniently stored in the base unit. The spray guns are incredibly simple to use - even for beginners. All the parts used to guide the paint are fitted with the tool-free 'SDS principle', allowing for easy paint changes. When work is interrupted, simply put the spray gun down in the 'parked' position. Paint tanks of either 600ml or 800ml are available for spraying surfaces of different sizes. The Bosch PFS system is quickly cleaned. All you have to do is spray repeatedly with water or solvent until clear liquid flows out. Then clean the individual parts separately. The new Fine Spray Guns are also quieter than the so-called airless spray systems. The Bosch PFS 55, 65 and 105E will be available at B&Q from mid-October 2008. Their recommended retail prices are £59.99, £99.99 and £139.99 respectively, including VAT. For further information call: 0844 736 0107. They come with a free DVD containing tips on how to use the individual systems.